Megan and Amy announce multiple prizes, and talk about tons of seasonal goings-on. Grab your knitting and join us! We hope that everyone had a great American Thanksgiving and is enjoying December. Lots of FOs and new cast-ons to show! Grab your knitting and join us! Megan and Amy have lots to show and share, including spinning and sewing. Grab your knitting and join us! Megan and Amy have giveaways, and talk about their current and future projects. Join us! Megan and Amy have exciting new projects cast-on, and of course songs to sing! Join us! Megan and Amy are back to "normal", as normal as we get! We take a look at past knits in our knit-stalgia segment, and of course talk about what we are currently knitting. Megan and Amy have tons of catching up to do, with prize drawings, tons of FOs & WIPs, ZK2015 retreat recap, and purchases. Take a look at all the awesome goodies from totally generous fiber arts vendors that were donated as ZK2015 retreat prizes. Please join us in thanking and supporting these folks that support our knitting community! Megan and Amy have a few things to share as they busily prepare for their retreat in Rochester next week. Things should be back to the regular flavor of crazy soon! 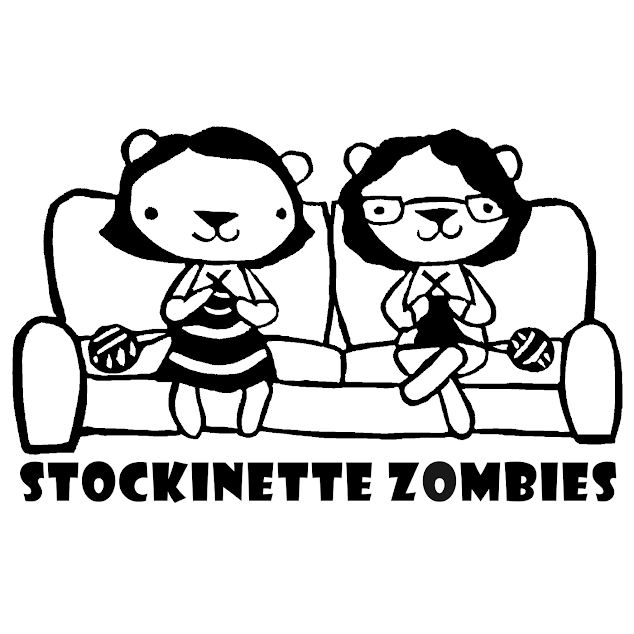 Megan and Amy return after a few illnesses invade Rochester, and are preparing for a zombie invasion in a few weeks. Yarn review of: String Theory Yarn! A late night retreat planning session has Megan and Amy recording late at night, and we are a little punchy. Join us for some epic FOs, and lots of silliness. Megan and Amy draw for lots of wonderful prizes, share projects in progress and completed, and also have some enabling. Megan and Amy have been busy and procrasti-knitting. Megan and Amy share their YarnOver 2015 fun, purchases, and of course their knitting. Megan and Amy are excited about YarnOver 2015, projects on the needles, and Elegant Economy's Date Night Collection. After breaking for Spring Break, Megan and Amy are back with tons of prizes to giveaway and announce. Join us for knitting chatter and a few laughs! Megan and Amy are wishing for warmer weather and hoping everyone is staying safe and warm out there. Megan and Amy share new products from Spud and Chloe, and Fix a Stitch, and of course their knitting. Megan and Amy draw for 3 awesome prize drawings, have shiny new FOs, and tons of exciting new WIPS. This is episode 160, not 161 as stated in the podcast. Megan and Amy have prizes, FOs, surprise mending, and January Thaw 2015 chatter. Megan and Amy have lots to talk about this week (as always), including YarnOver, WIPKnitDown, crazy cast-on-itis, and a review of Eternity Ranch Yarns. Megan and Amy are recording on Sunday's now, Megan has 2 newly published patterns, and Amy is #wipknitdown2015 . Megan and Amy look back on their favorite knits of 2014, and look forward to 2015 knits.